A £10,000 reward has been offered in connection with the disappearance of a woman thought to have been murdered. 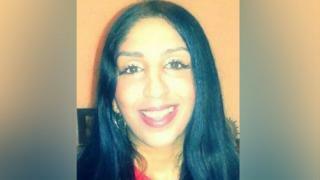 Naheed Khan, 43, from Middlesbrough, was reported missing on 12 June, but had not been seen by her family for three weeks before then. Despite searches of several locations, including a disused underground car park, she has not been found. The charity Crimestoppers said the reward was for information leading to a conviction. A 39-year-old man arrested on suspicion of murder has been released pending further inquiries. Cleveland Police said officers have so far pursued more than 2,000 lines of inquiry and interviewed almost 1,000 people. Fiona McCormack, from Crimestoppers, said: "This is a particularly distressing case where a devoted mother from a large family suddenly disappears without warning. "Naheed was a loving mother, daughter, sister and aunt and has missed out on the birth of her granddaughter Aria, who is now nine months old. So her disappearance is all the more worrying and explains why the worst is now feared. "We believe someone may have information on this suspected murder that could make all the difference in helping find out what has happened and to give her family some answers they so desperately need."